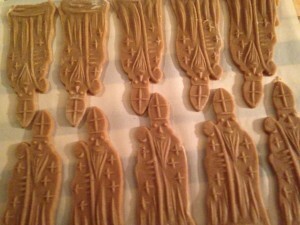 You may be able to find authentic St. Nicholas shortbread or cookie molds online in 2018, but there were NONE to be found in the USA 25 years ago when I decided I would no longer use my homemade cookie cutter (strips of a tin can shaped around a cardboard cutout of St. Nicholas with his bishop’s miter and crosier). 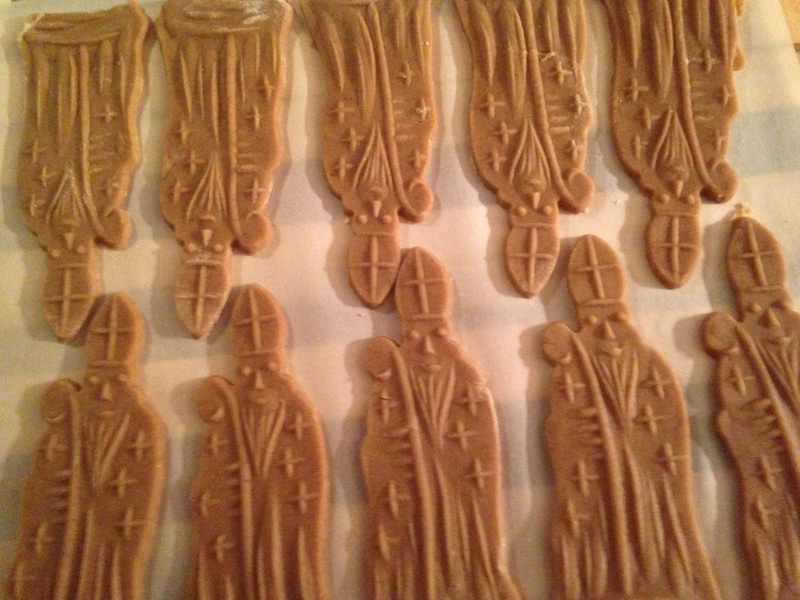 So I asked a British friend who was living in Belgium at the time, to find me a set of St. Nicholas cookie molds. She sent them for my birthday in 1994 (early–since my birthday is actually 3 days later than St. Nicholas Day). She also sent a recipe–in Flemish–for the famous Speculaas cookie dough that has been used to make “images” (Speculus is the Latin for “mirror” or “reflection”) since the High Middle Ages. 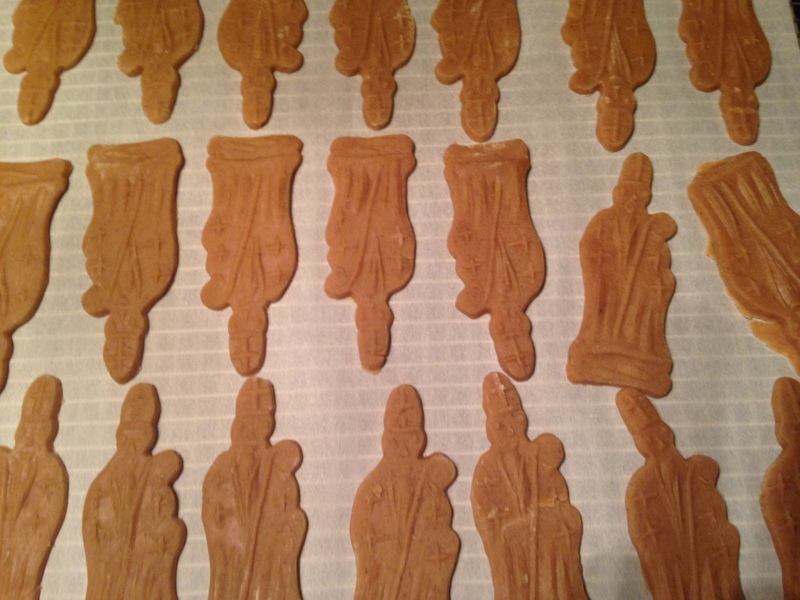 You can find hundreds of them online using either the Dutch/Flemish “Speculaas” or the German “Speculatius” in your search engine. 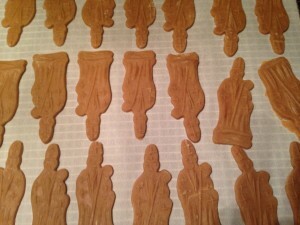 The flavor of the cookies reminds lots of people of the old “Windmill” cookies (which are also made as “images”). I have tried several recipes over the years–many of them too soft to press into the wooden molds (which must be floured thoroughly and pounded on the counter before pressing and cutting the dough). Gradually add spiced flour to creamed mixture until all has been incorporated. 1 cup flour until dough is quite heavy. Then wrap in plastic or waxed paper and refrigerate several hours (or a few days). 2. Remove 1/4 of the dough from the refrigerator at a time. Cut into 1/4- to 1/3- inch slices. 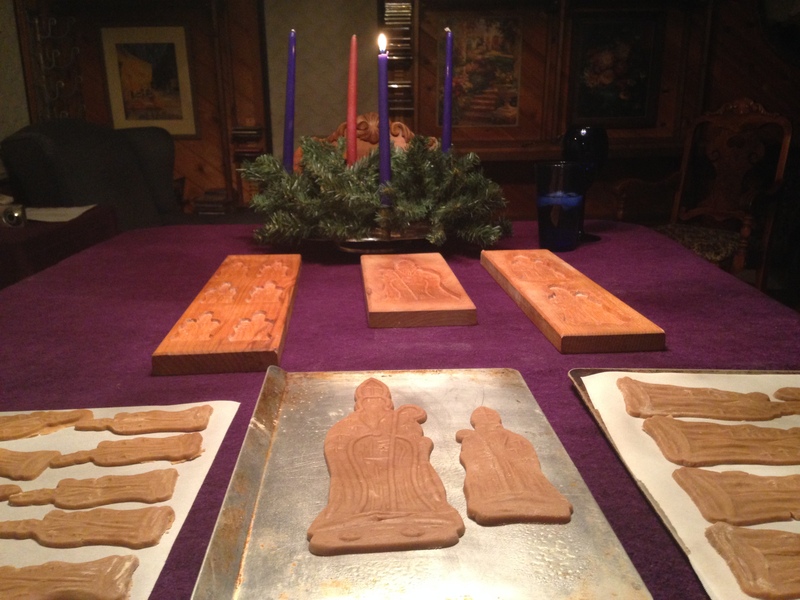 Flatten and then press slices into cookie molds. (Do this quickly–you do not want the dough to get warm). 3. Using a long sharp knife (I use a thin bladed chef’s knife) slide the blade parallel to the surface of cookie mold to slice off the excess dough which can be gathered together, put back into the refrigerator or freezer and used again. 4. With a sharp paring knife, gently cut around the edge of each cookie–or at least around the head and crosier to loosen the cookie. 5. 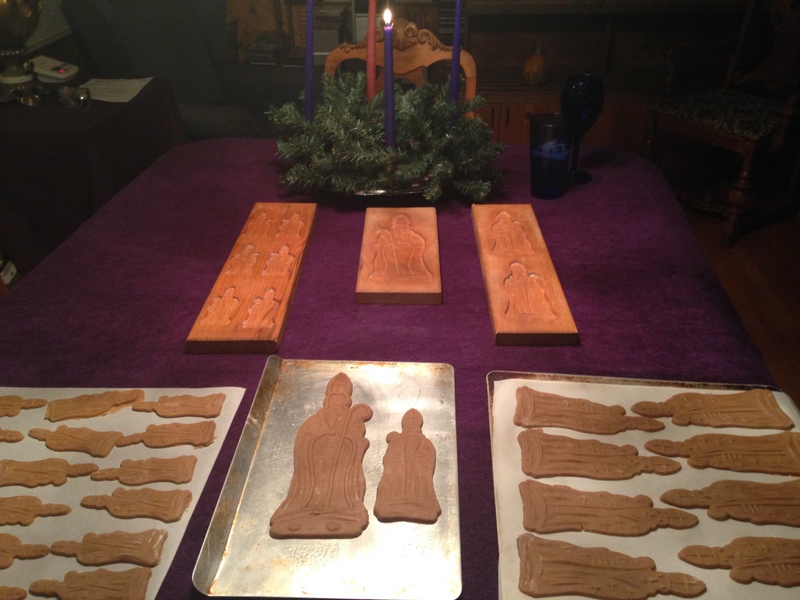 Turn the cookie mold over and tap (or pound sharply) the bottom edge of the cookie mold on the counter until St.Nicholas drops out. 6. Place each cookie on a parchment-paper lined cookie sheet. 7. Bake at 350 degrees until lightly brown–12-15 minutes. 8. Remove from parchment and cool on wire racks. When cooled to room temperature, place in airtight cookie tins. These keep for months in a cool place (if you don’t give them all away on St. Nicholas Day.